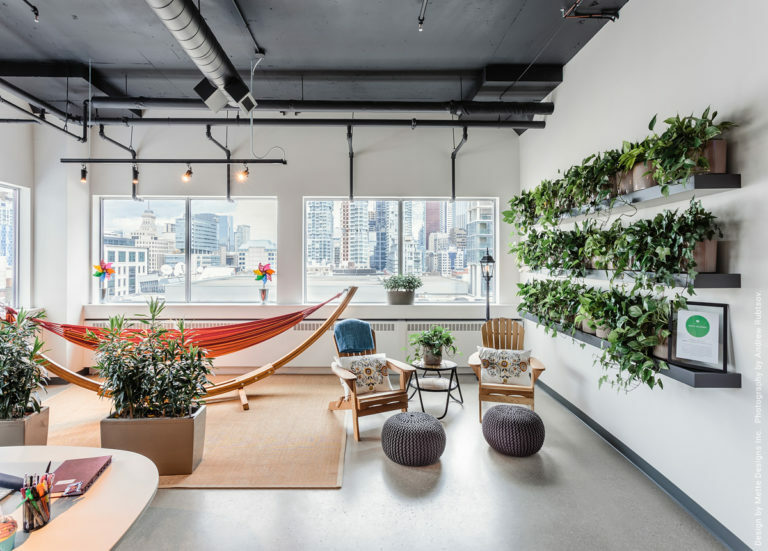 Would you like to have the benefits of a green wall in your office without the significant capital investment and maintenance fees of an integrated living wall? Consider our simple alternative. Over the years we have developed a simple, effective and affordable Green Wall. Our wall consists of basic shelving with an assortment of trailing-style plants in simple, inexpensive pots. The plants are allowed to grow naturally, with minimal pruning, so that they cascade over the shelves. Maintenance is straightforward, quick and efficient without the need for a built-in water supply, pumps and all the other equipment needed for a pricey high-tech wall. The plants can be all one variety, several varieties arranged randomly for an informal look, or arranged in a specific planned pattern. If it is necessary to occasionally replace plants, the process is quick and clean. We have found that because each plant is watered individually, and not via an irrigation system that delivers the same amount of water to each plant, we rarely need to replace plants. In addition, it is possible to use a larger variety of plants, with no restrictions based on the need to use plants with the same water requirements. This type of wall can be custom fit to any wall or any budget with ease. Shelving can be made from basic pine planks, or a more refined wood. Pre-built, easy to hang shelves like those offered by Ikea work great. The shelves can be arranged in any configuration and any size. 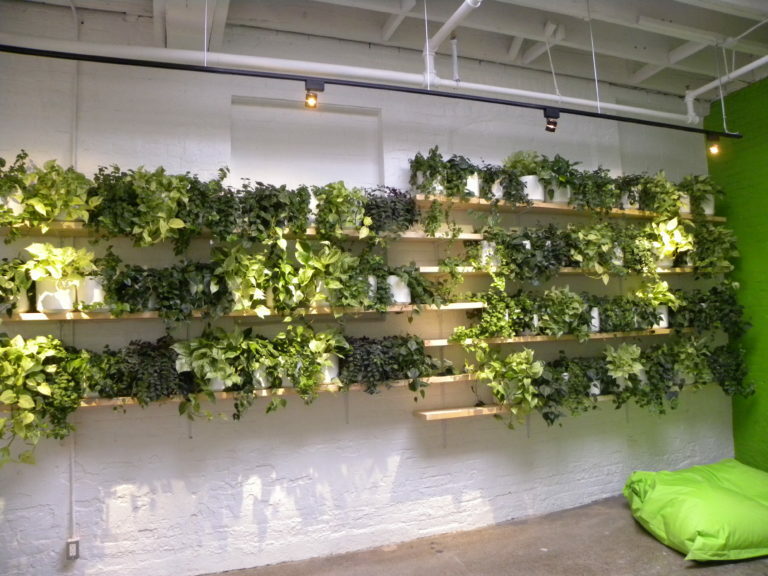 This makes our green wall flexible and adaptable to any space. The images below are examples of our green wall. Use your imagination and find a perfect place in the office for your own green wall!